Stan Arnaud watched the Classic Rock Show – Guitar Greats World Tour 2018 at Inverness’s Eden Court. Freezing conditions outside were soon forgotten as the Classic Rock Show warmed up an enthusiastic Inverness audience with a rousing tribute to some of the world’s greatest guitarists. 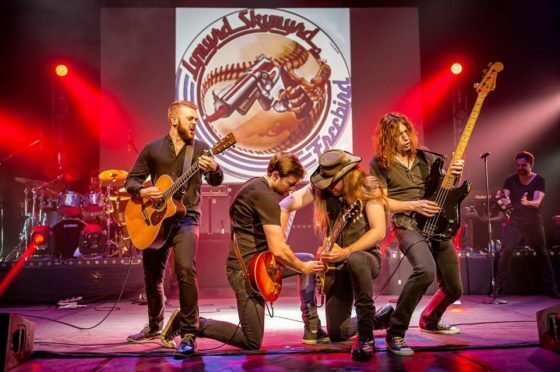 On the final night of a 30-date UK tour, the highly talented eight-piece band energetically brought a string of familiar anthems to life, with the accuracy of their delivery aided by the authenticity of excellent old-style rock and roll sound and lighting. Nearly two-two-and-half hours after opening with Led Zeppelin’s Whole Lotta Love, they had the almost full house at Eden Court Theatre on its feet demanding more. Following the second number – Free’s Wishing Well – a show of hands called for by one of the group’s three superb main vocalists, Rudy Cardenas, revealed many of those in attendance were back for more, having seen them in the city before. Describing their show as “the classic rock fan’s ultimate live jukebox,” the band demonstrated the talents of members including singers Johnny West and Emily Jollands and guitarists Howie G, James Cole and Wayne Banks with precise and passionately performed covers of hits by stars such as Eric Clapton, Queen, Meatloaf and ZZ Top. Among the songs that stood out in particular in a well-chosen, wide-ranging set were Jimi Hendrix’s All Along the Watchtower and the atmospheric classics Hotel California, by The Eagles, and The Doors’ Riders on the Storm. It was the first strains of ACDC’s Highway to Hell that brought the audience out of their seats as the second half built towards its finale. Their appreciation of a great evening’s entertainment was still clearly evident as renditions of Van Halen’s Jump and Lynyrd Skynyrd’s Freebird led to a thundering close with The Who’s Won’t Get Fooled Again.